There are several tourist attractions in Jeddah and sightseeing places such as the impressive king’s fountains, the glorious floating mosque, Biet Nassif a symbol culture and heritage, the world’s tallest unsupported flagpole, the holy Mecca gate, the art gallery, the biggest Globe roundabout, the Jeddah lighthouse as it’s a port city, Middan Addarajah, west sky aviation etc. 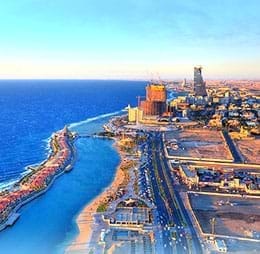 Jeddah boasts of many shopping malls such as the Red sea mall, the mall of Arabia Jeddah, Darat Safeya Bizagr, al Salam mall, Haifaa mall, Gabel street souq, Aziz mall, Jeddah international market and the MAison BO-M. Shawarma is the standard cheap meal commonly found in almost every corner shop. Other delicious dishes such as the Filipino Souk and the Pakistani Kababish are served well in the Saudi city. There are many sightseeing tourist places in Jeddah, specifically for nature lovers. The scenic Fakieh aquarium and the silver sands beach are breathtaking. Jeddah markets, the old city buildings, key historical mosques, and the UNESCO’s World Heritage Committee approved Historic Jeddah World Heritage Site is must visit. The Jeddah Festival is a glorious event which is one of the tourist attractions of the city. This event takes place in June or July. Around 200 exciting events are organized under the common umbrella. This outstanding event serves all the local handicrafts, traditional Saudi dishes, etc. Visitors can watch the opening fireworks blazed over Jeddah’s remarkable Corniche. Buses, cars, and ferries are most commonly used modes of transport in and around the city. Almost all the hotels offer Water taxi or a small minivan. The airport consists of 4 terminals. North Terminal – North Terminal serves regular international flights and operates an additional of 20 international flights during the Hajj and Umrah seasons. South Terminal – This serves both the domestic and international flights. It boasts of two public restaurants and a 60 room hotel. VIP Terminal – This terminal is exclusively for the heads, official guests, and Kings of the state. Reaching Jeddah airport is quite easy as it is served by taxis, buses, and limousine. There are plenty of public buses that serve the passengers from the airport to different major places like the city center, Mecca, and Medina.